One Leg Pose is also known as "Eka padasana". Eka padasana or One Leg pose is balancing yoga pose. Eka padasana is the combination of 3 Sanskrit words, 'Eka' + 'Pada' + 'Asana'. Eka means 'One', Pada means 'Leg', and Asana means 'Pose'. One Leg pose is also known as 'One foot pose'. How to do One Leg Pose? Now slowly bend forward from your waist with hands straight, stretched and parallel to ground as shown in picture above extend arms. Now slowly lift the right leg backward without bending it from knee up to it becomes parallel to ground as shown in picture above extend right leg. Maintain the balance on one leg. To maintain the balance focus on fixed point on floor or anything. Gently breathing also helps to maintain the balance. Then slowly come back to the original / starting position. Stand straight with legs together and hands straight down touch to the side of the thighs, like Tadasna or Mountain yoga pose. Now just change the leg, this time take left leg and lift it from backward. 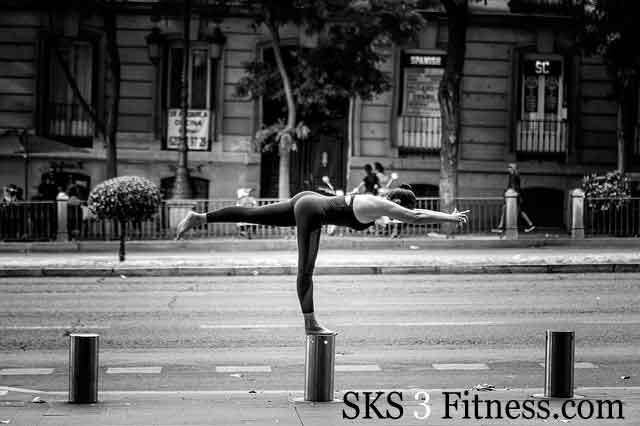 Try to maintain balance of your body on one leg as much possible as you can. You can interlock fingers of both hands in this Yoga pose, or just do it in Namaste Mudra like above picture. I prefer closed eyes. Closed eyes also help you to maintain the balance. Regular practice of One Leg Pose increase concentration. This Yoga pose strengthen leg muscles like hips, thighs, calf’s etc. Regular practice of One Leg Pose improves balance and co-ordination of the body. One Leg Pose gives a good stretch to muscles of lower back. One Leg Pose also stretches and strengthen the muscles of neck and shoulder blades.